For our show Serious Fun I found myself in a few different modes. First I wanted to reach back to my earlier mostly narrative line but add a more light a airy feel to it. I worked with copper and my etched brass but added a hinged sterling component to it. 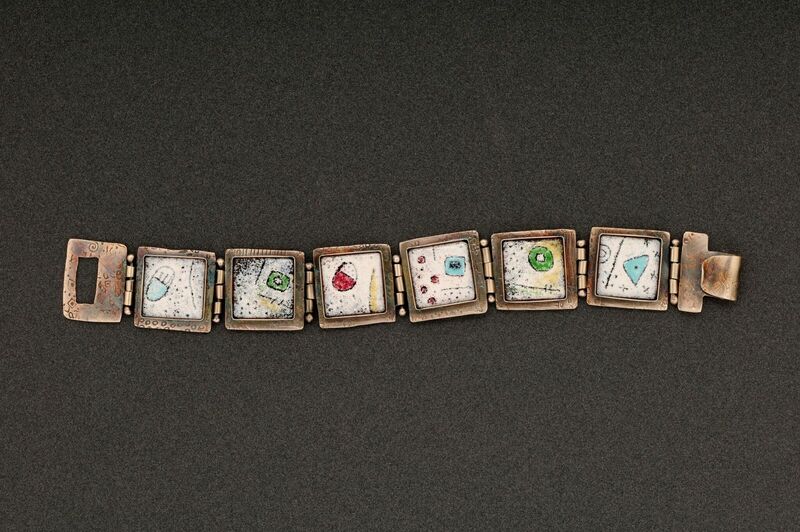 I also got inspired by a collaborative piece I did with Pringle Teeter when she asked me to make a chain for her Hunter’s Globe in our All about the Story Exhibit. The more the world around me seemed to becoming unhinged the more obsessed I became with hinges and I made a couple of necklaces and bracelets that were created mostly of hinges. I loved the light and airy feel they have. Then I got in a mood to work on some of my serious work of a more tailored line. I felt like I was searching for some sort of stability. All the while I was reading books, magazines and watching tutorials on how to fire enamel during the slow times on my shifts at the gallery. 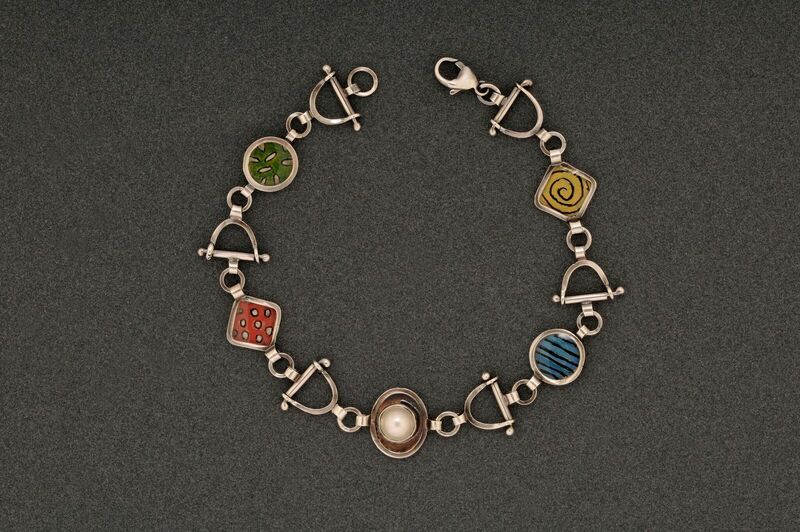 I have wanted to learn torch enameling for a long time. I began ordering the things I knew I would need and one day I sat down with my book and began experimenting. I loved it from the first firing I did! I found I could mix my light and airy component to the sturdy and stable piece of enamel and find a comfortable balance. I loved the way my friends and family and gallery folks reacted to my newest line at our opening! I loved that so many people wanted to try it on and hold it in their hands. 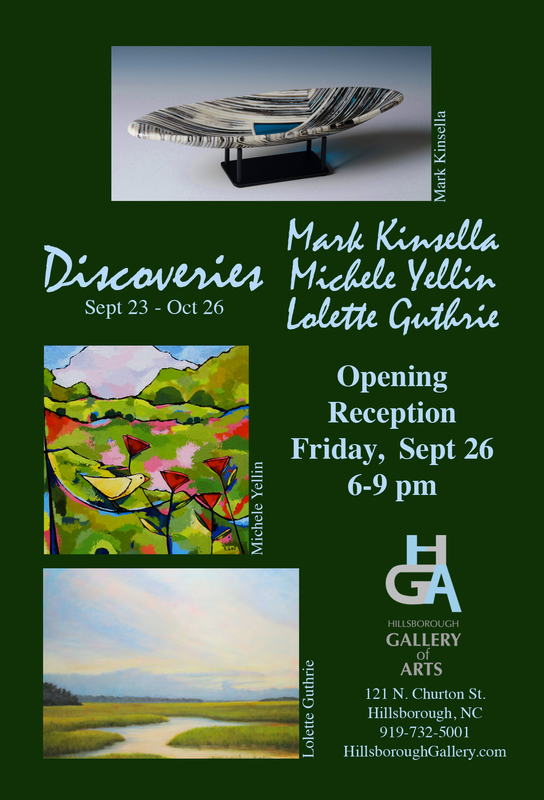 And having my exhibit along with Ali Givens and Michele Yellin, with all their big bold happy colors made our title Serious Fun fit perfectly into the space..
A big part of the joy of creating art can come in experiencing the reactions of others. 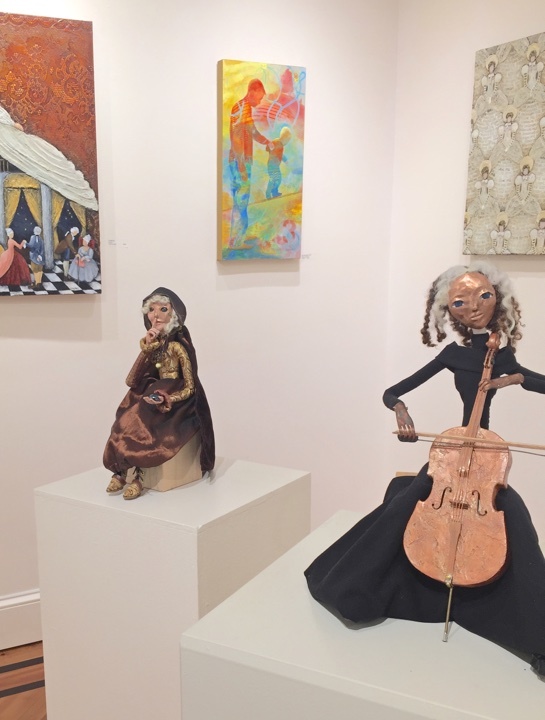 I enjoy watching people in the gallery approach my figure sculptures for a closer look. They have the exact opposite effect of an expansive painting where a step back will get the best view. 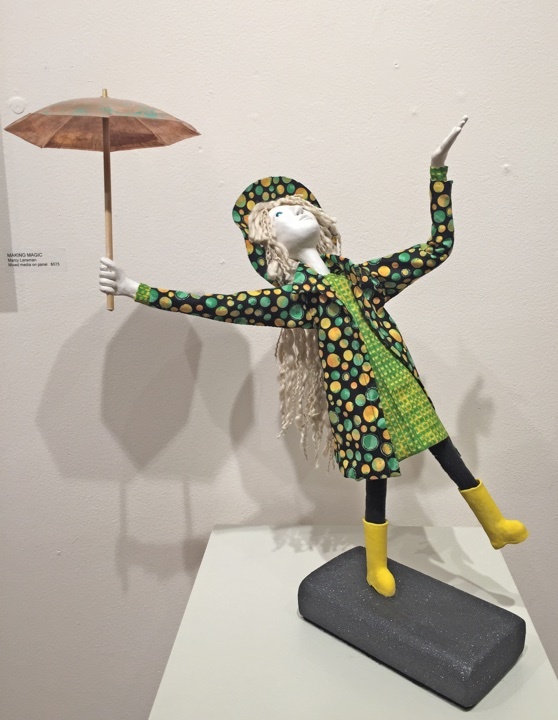 Their scale as art dolls requires the viewer to approach, crouch down, and perhaps walk around. It is in this intimate proximity that each piece can reveal all the little surprises and details I have worked in to the final design. It is rewarding to have those who appreciate my work take note and tell me and others what they see there. I experienced several of these moments at the opening reception of Go Figure! One woman viewing my piece “Cello”, asked if I had myself played the instrument. I replied that I had not, and asked what had made her ask. She said that she had played the cello, and that I nailed not just the posture of the figure, but that her hand, wrist, and finger positions were spot on. I told her that I had in fact spent time pouring over images of cellists for that exact reason. A couple was looking quite carefully at “Getting Lift”. The husband asked his wife to walk this way to see the stitching on her helmet, just as the wife told him to come to the back so that he could see how I had laced the wings on to her back. They both told me that it truly appeared that she was just about to take off from her base, and inquired what the key chained to her belt unlocked. Others remarked that they didn’t truly appreciate “Secrets” until they were able to get up real close and see the expression on her face, or the fact that her boots just happened to match the fabric of her dress bodice. Of “Lacing III”, one viewer told me that she could really see the dancer’s concentration to her task. A number of people told me that they could place themselves right in the moment I tried to capture with “Sunshine on a Cloudy Day”. They all noted the joy and freedom of the figure despite the weather she was probably experiencing. Perhaps most rewarding, were the comments that surrounded the show Go Figure! itself. Most saying that beyond the obvious connection of human figures, that there was a brightness and strength of spirit that tied all of the artists work together. 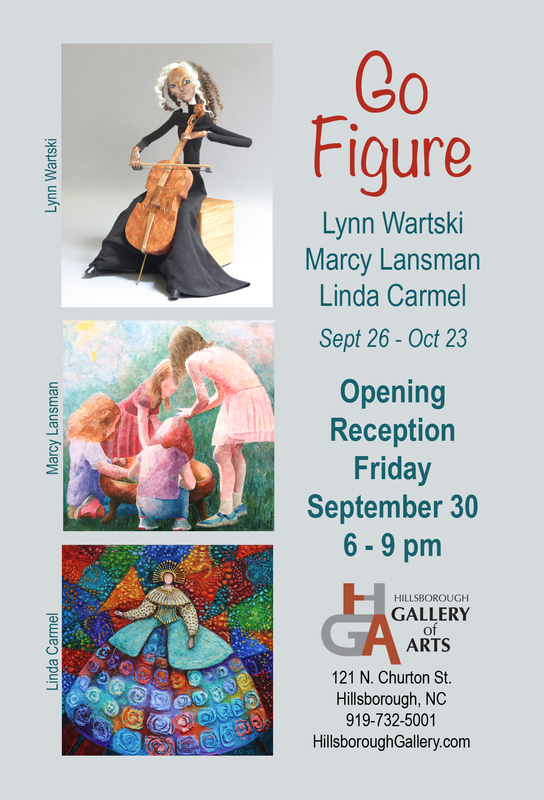 Lynn Wartski’s imaginative sculptures portray the human body as art dolls. Wartski states, “This medium allows me to explore and play with a wide variety of materials and techniques yet still maintain visual cohesion. Inspiration for these small scale figures comes from places both common and unexpected. 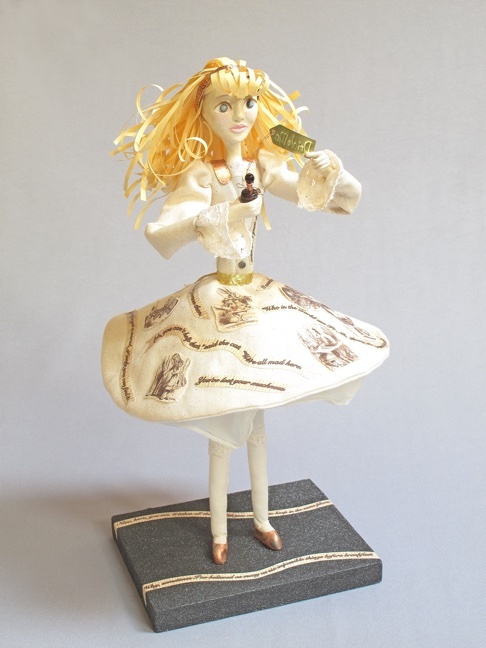 I delve into the worlds of art, literature, mythology, legend, everyday life.” Lynn uses a variety of materials in her mixed media dolls, but it is her use of metal that links these dolls to her earlier work. This is a time in history when women are entering the workplace with qualifications equal to men. Women have the expertise to have full and satisfying careers. Having a family has become a choice not an expectation. I find myself reflecting on my evolving understanding of what it means to be a women in today’s society and how this affects the family structure as we know it. In this series of paintings I wanted to celebrate inherent female strengths, as mothers, peacemakers, nurturers and keepers of the home. Many of the women in this series are portrayed as queens, in some cases regal as in Queen Mother and others more “tongue in cheek” as in Homecoming Queen, Dairy Queen and Queen Bee. I have included a couple of “future queens” too. My Little Princess explores our desire to keep our young ones safely protected in the nest. The painting Work In Progress deals with adolescence. I have included phases within the painting that track the journey towards adulthood from “hold me”, to the beginnings of self in “I want” to “you can’t make me” and finally “I am me” and “This is my life”. My paintings are sculpted with acrylic modeling paste and then painted, creating a three dimensional surface. In some of the pieces I have experimented with some new materials. Queen of the Universe and Home Keeper are painted on a surface of rice paper that is overlaid onto modeling paste. My Little Princess is drawn with colored pencil in between layers of matte gel medium. The piece I chose for the postcard image for the show, “Balloon”, is a good example of this extension with narrative. 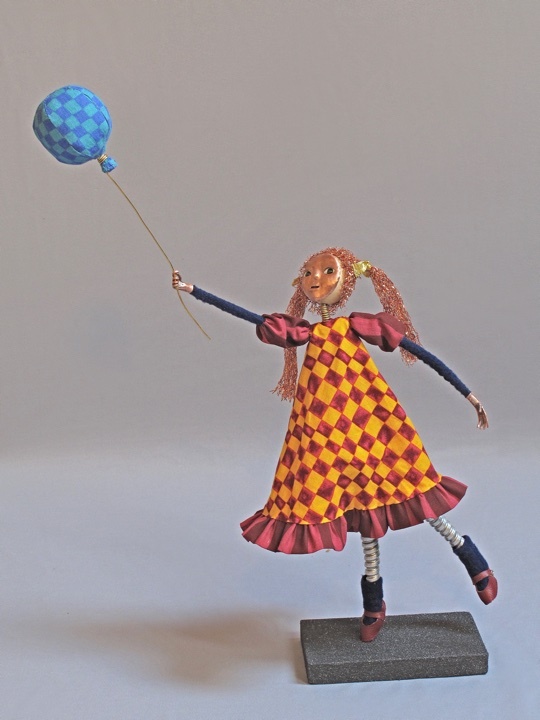 A small figure with pigtails is stretching on tiptoe while grasping the end of a balloon string. Is she in the process of loosing her grasp? I she running along with a breeze? Perhaps it is a magically strong balloon that will carry her away? I guess the answer resides with each viewer. 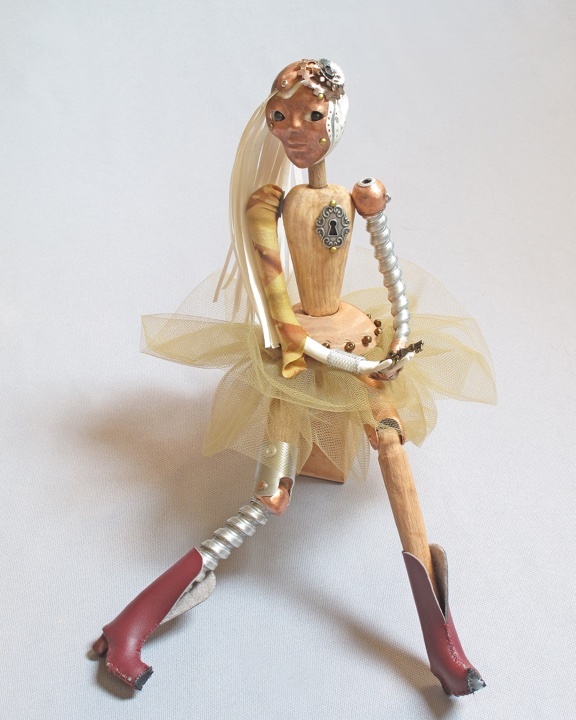 I have also continued my experimentation with new materials and media incorporation into my art dolls. Though I know that I never would want to fully step away from the copper that has become a trademark of my work, I have enjoyed playing with other materials as the main component of a piece with the metal in a supporting role. My piece titled “Media” is an example of play and experimentation with materials. 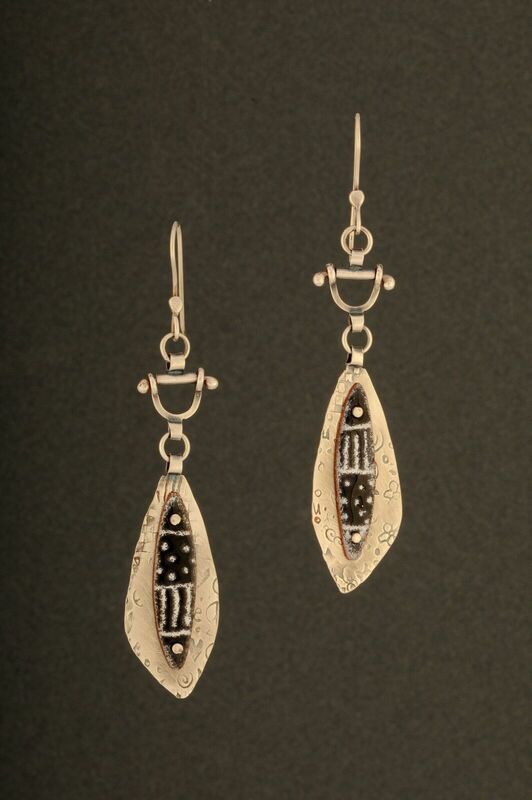 Though she still began with a copper face that I hand hammered, the rest of her creation took a number of detours. I shaped her torso, skirt top, neck, and one of her shins from wood. Her head and one arm are paperclay over an armature, and her hair is hand cut parchment. Lastly, her multiple mixed media arms and legs are articulated with joints rather than my usual bendable padded wire frame. One piece that nicely brings together both the elements of narrative and expanding media is “Paper Alice”. My version of Alice in Wonderland steps out of a story that many already know. I based this art doll on pen and ink illustrations from a classic edition of the book.I fully sculpted her head and arms from paperclay, and metal is found only in her accessories and details. Images and favorite quotes from the tale are worked into her clothing and on her base, and she has a wig made of strips of parchment paper. I thoroughly enjoy creating these art doll figures, and even more, people’s reactions to them. Michelangelo said, “Every block of stone has a statue inside it and it is the task of the sculptor to discover it.” For me, searching the textured, abstracted, multi-colored surface of my canvas, I ache to discover what each painting wants to reveal to me, and thus become. This is my great challenge, and when detected and captured, my great joy. I have no luck in forcing things along. There are processes I rely on and yet I have no formula guaranteed to bring the painting into being. It is only with the alchemy of materials, skills, intent and some form of magic that allows me to discover what the painting’s true nature is. To see it, I have to not look for it, or rather look in an oblique manner, and then, if I am lucky, I make my discovery. These paintings are what were waiting in the paint to be painted. 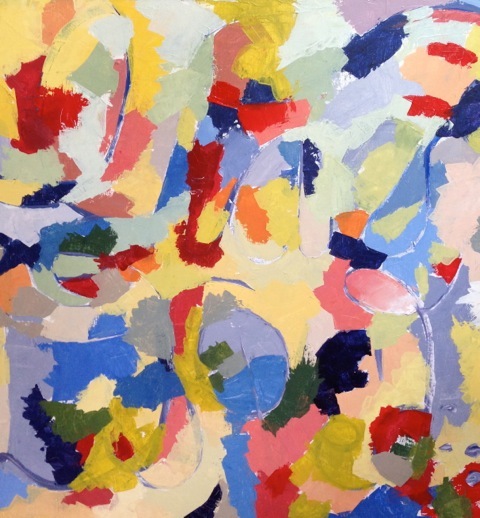 In this painting, THERE IN THE WILD PLACE, I started by painting in big loopy letters “I have discovered”. I continued painting until the words were no longer visible. I really revel in this part of the process. It is so pleasant, just adding color here and there. 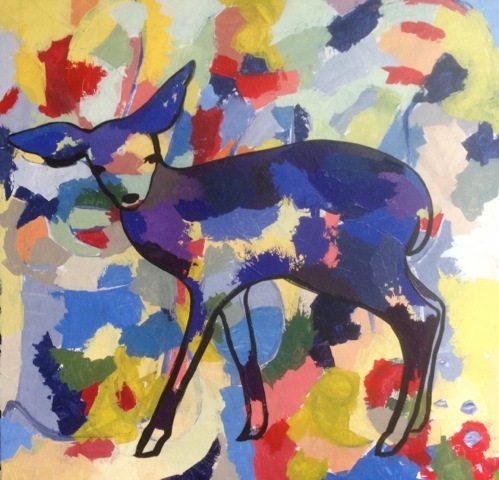 When I finally finished the under-painting and begin looking, the hindquarter and one ear of the fawn were almost immediately revealed to me. That is kind of unusual. Typically it takes a lot of searching. And because it was unusual, it was a little bit hard to trust. 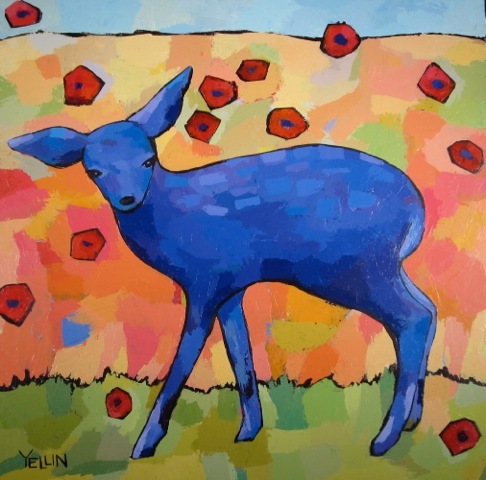 I had seen 3 fawns in the last couple of months, but still…to have one show up so quickly in my abstract field of color? 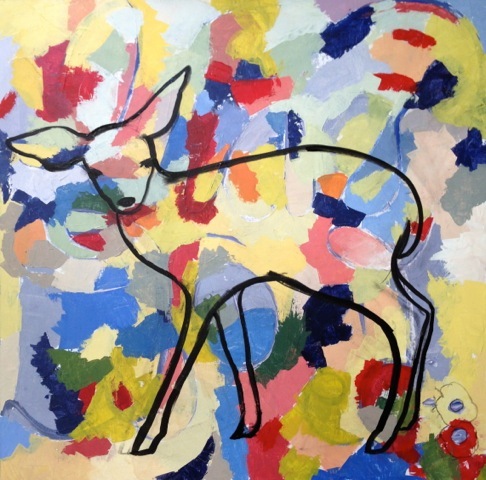 After some drawing and erasing on the canvas, I decided not to fight the fawn. If it wasn’t meant to be, that would become apparent. I continued on painting, adding paint and then painting over things I didn’t like. I usually take photos when I am creating a painting to help me with the process of figuring out what is working and what isn’t. The camera gives me a small image that is often easier to evaluate than the full size canvas. After many hours, I was very happy with the fawn and her surroundings, and she was THERE, IN THE WILD PLACE. She is there to remind me, she is always willing to take me away from ordinary domestic life. She offers a reprieve from all the chores that have yet to be done, and a path for me to rediscover my true self. As a landscape painter, Lolette Guthrie seeks the essence of a place in order to create visual metaphors celebrating the incredible beauty and diversity of our world. “My paintings are always paintings of light and atmosphere” says Guthrie “and I strive to capture the ephemeral nature of light at a moment in time that transcends the subject and captures a mood that is timeless.” Working in both oils and in pastels she applies countless layers of pigment one on top of the other, allowing each layer to show through, giving a wonderful richness to the surfaces. For this show, Guthrie concentrated on painting skies that by themselves give the viewer a sense of space, light, time of day, temperature, and weather. In most pieces, the foreground is the accent note. Mark Kinsella has been working with glass for more than 10 years and continues to develop his technique. Incorporating new processes into his work, he is always evolving and changing, trying new styles, and producing fresh and different work. Kinsella draws inspiration from nature, movies and life experiences, using his photography background for interesting composition and color combinations. His work is sometimes functional, sometimes sculptural and often both.